Purpose: Increased habitat for Squirrel Gliders and woodland birds (as identified in the BioBlitz). Funding: This activity was supported with funding from the Commonwealth's Caring for our Country Community Action Grant. Albury City Council provided lunch and 1.8 metre Hume and Hovell cloned tree. Planting native trees, shrubs and grasses. Barbed wire removed on adjacent fences. Direct seeding demonstration provided by the Murray Catchment Autority. 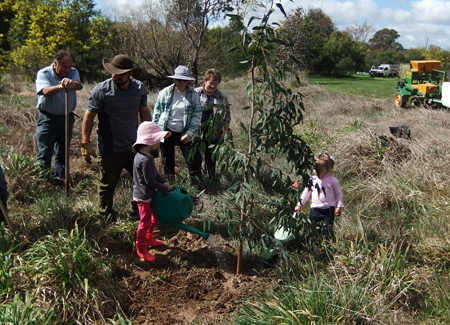 Clone of 1.8 metre Hume & Hovell tree planted. 350 tubestock trees, shrubs and groundcovers planted, guarded and watered. Barbed wire removal on adjacent fences. Greater knowledge of direct seeding gained via CMA demonstration.